George Inness etching "The Saco River Valley"
Medium: etching (after the painting). 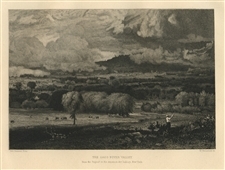 Etched by William Wellstood after George Inness. Published in Boston in 1887 by Estes & Lauriat. Plate size: 6 3/4 x 9 inches. Signed in the plate (not by hand). A fine impression on cream laid paper. Condition: handling creases and wear to the paper. 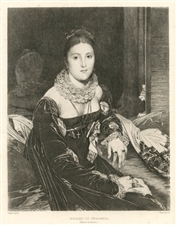 Jean-Auguste-Dominique Ingres etching "Madamme de Senonnes"
Medium: etching (etched by J. Patricot after Ingres). This impression on laid paper was printed in 1903 and published in Paris by the Gazette des Beaux-Arts. The image measures 7 1/4 x 5 3/4 inches (182 x 145 mm). Not signed. Robert Indiana silkscreen "Salute To H.R 11308 As Amended"
Medium: original silkscreen. Beautifully printed ca. 1968 for the cover of an invitation to an event to promote funding for the arts. House Resolution 11308 was a 1968 bill passed by the United States Congress pertaining to funding the National Foundation of the Arts and Humanities, a cause embraced by Robert Indiana. Size: 5 x 7 inches. Not signed. A brilliant impression in rich, vibrant color! Jean-Auguste-Dominique Ingres etching "Portrait de femme"
Medium: etching (etched by Felix Bracquemond after Ingres). This impression on chine-colle paper was printed in 1903 and published in Paris by the Gazette des Beaux-Arts. The image measures 4 5/8 x 7 1/4 inches (213 x 140 mm). Not signed. Medium: original etching and drypoint. Executed for Abel Hermant's "Bigarrure", this beautiful Louis Icart etching was published in Paris in 1928 in a limited edition of 1100. Plate size: 5 1/4 x 3 1/2 inches (130 x 88 mm). A nice impression on cream laid paper. Not signed -- Louis Icart did not sign any impressions of this etching. Medium: original etching and drypoint. Executed for Abel Hermant's "Bigarrure", this beautiful Louis Icart etching was published in Paris in 1928 in a limited edition of 1100. Plate size: 5 1/4 x 3 1/2 inches (130 x 90 mm). A nice impression on cream laid paper. Not signed (there were no signed impressions of this drypoint). Condition: there is some foxing to the margins. Medium: original etching and drypoint. Executed for Abel Hermant's "Bigarrure", this beautiful Louis Icart etching was published in Paris in 1928 in a limited edition of 1100. Plate size: 5 x 3 1/2 inches (125 x 90 mm). A nice impression on cream laid paper. Not signed (there were no signed impressions of this drypoint). Medium: original etching and drypoint. Executed for Abel Hermant's "Bigarrure", this beautiful Louis Icart etching was published in Paris in 1928 in a limited edition of 1100. Plate size: 5 1/4 x 3 1/2 inches (132 x 90 mm). A nice impression on cream laid paper. Not signed (there were no signed impressions of this drypoint). Medium: original lithograph. 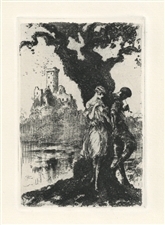 This lithograph was printed for XXe Siecle (issue number 41) in 1973, published in Paris by San Lazzaro. Image size: 8 3/8 x 8 3/8 inches (210 x 210mm). The sheet size is 12 1/4 x 9 inches. Not signed. Robert Indiana serigraph "Santa Fe Opera"
Medium: original silkscreen / serigraph poster screenprint. Published in 1976 by the Santa Fe Opera. Size: 31 x 25 inches. A rich impression on heavy wove paper with metallic foil accents. Not signed. Robert Indiana original lithograph "Angel More"
Medium: original lithograph, from Robert Indiana's "Mother of Us All" series, issued in 1977. Image size: 18 x 14 inches; the total sheet size is 23 1/2 x 19 1/2 inches. A nice impression on quality Arches paper. Not signed or numbered. Robert Indiana original lithograph "Gertrude Stein"
Condition: there is a bump to the bottom right corner of the sheet (not affecting the image). Robert Indiana original lithograph "Henrietta M."
Robert Indiana original lithograph "Indiana Elliot"
Medium: original etching. Catalogue reference: Sanchez & Seydoux 1879-9. Printed in Paris by A. Cadart and published in 1879 by Gazette des Beaux Arts. Plate size: 5 3/4 x 9 inches (145 x 228 mm) on laid paper. Not Signed. Jozef Israels also executed a painting of this same subject. Condition: there is some minor foxing to the paper. Thomas Moran / George Inness etching "An American Sunset"
Medium: etching. Catalogue reference: Klackner 63. Executed in 1888; this charming landscape was etched by Thomas Moran after George Inness. This is a nice impression printed on laid paper circa 1900. Size: 5 1/2 x 7 3/4 inches (plate). Not signed. Medium: serigraph / silkscreen (after the original). Printed in Germany in 1971 by Domberger Stuttgart. Sheet size: 8 x 8 inches (205 x 205mm). This is a good impression of Robert Indiana's most iconic print in rich, silkscreen color. Not signed. Condition: there are two small spots to the left of the V.
Medium: original serigraph / silkscreen. In 1964 Samuel Wagstaff, Jr. (at that time Curator of Paintings at the Wadsworth Atheneum in Hartfordford, Connecticut) selected ten important American artists and asked them to contribute original prints for the portfolio “Ten Works by Ten Painters”. This was issued in 1964 in an edition of 500. The publisher's blindstamp is in the margin near the bottom right corner. Not signed. The other artists collaborating with the project were Stuart Davis, Ellsworth Kelly, Roy Lichtenstein, Robert Motherwell, George Ortman, Larry Poons, Ad Reinhardt, Frank Stella and Andy Warhol. Image size: 17 1/2 x 16 inches (445 x 408mm). Printed on wove paper with full original margins, the sheet measures 24 x 20 inches. Condition: there is a mat stain in the margin.